What! I don't find this gist funny at all. 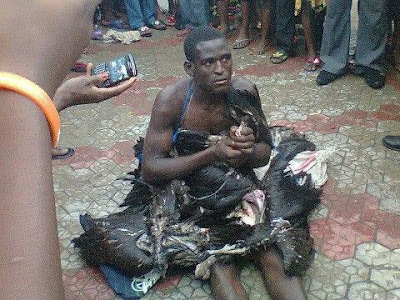 This man was caught trapping vultures in Onne, Portharcourt that he roasts as suya chicken and sells to unsuspecting customers. His excuse was that he used to sell real chicken but chicken got too expensive, so, he started trapping vultures and selling to his customers. He catches the vultures by rubbing snuff on fresh meat to make the carcass-eating ugly birds dizzy and too weak to fly away after eating the meat. Abeg, is vulture healthy meat? Just the thought of vultures eating dead meat in refuse dumps and their very dirty looks make me want to puke.